Legacy Blueberry - Fruiting Plants | Michigan Bulb Co.
Plant this reliable, late-ripening Northern Highbush variety in your yard and extend your blueberry season well into summer! That means more time for you to harvest its juicy, tasty fruit, which can be used for fresh snacking, preserves and baked goods like delicious blueberry pies. Makes a stunning ornamental statement in the fall when its glossy, green foliage turns brilliant red and orange. 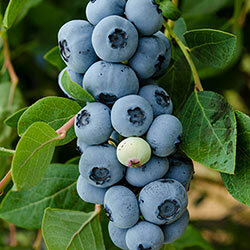 Self-pollinating and vigorous, Legacy Blueberry reaches 4–6' in height with a spread of 3–4'. Best results are achieved when grown in well-drained, acidic soil in full sun. Now shipping in a gallon pot. Zones 5–8. Foliage Type: Glossy green foliage transforms to brilliant shades of red and orange in fall.